Brenda Matchim is a classical style portrait artist. She is a native of Southern China, grew up in Hong Kong. She had a great desire for art at an early age. Later she furthered her study in Commercial Art in a private College in Hong Kong. In 1973 Brendas whole family immigrated to Canada. Newfoundland is her first stop and last stop. In 1980 she married a Newfoundlander from Eastport Bonavista Bay, they had two wonderful children. In 2005 Brenda and her husband retired from their life long restaurant business (operated over 20 years). Since then Brenda had pick up her paint brushes and reconnected with her long lost love affair -- Art. She is an active member of Art Association of Newfoundland and Labrador, and member of Realist Artists of Newfoundland and Labrador, and a member of Portrait Society of Canada. 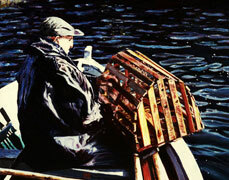 She is also the proud recipient of " Best of Show Award" Realist Artists 2005. 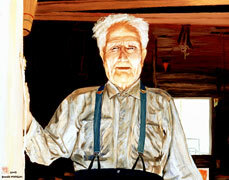 In 2009 the provincial art bank purchased one of her portrait "Uncle George" , it became a permanent collection at The Rooms art gallery in St. John's Newfoundland. Brenda traveled extensively, she is fascinated by people all around the world. She use oil paint exclusively, oil yield an unlimited range of rich colour combinations, and playfully easy to navigate. Her philosoply is work hard and play hard. She felt very blessed to be able to continue her love to pursue art, as a portrait artist -- life is absolutely priceless.